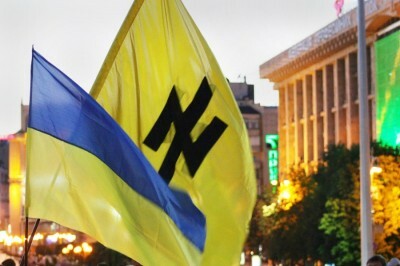 On Monday, August 31st, racist fascists (nazis) who hate Russians rioted in front of Ukraine’s parliament building to demand resumption of the unlimited bombing campaign against the breakaway former Ukrainian region, Donbass, which had voted 90%+ for the neutralist Ukrainian President, Viktor Yanukovych, whose government these nazis had helped the U.S. to overthrow in February 2014. A rabidly anti-Russian government was installed in its stead, and these demonstrators want this government to violate the Minsk II accords that Ukraine had signed, and to return to full-scale war. Poroshenko is doing this because Barack Obama, the man who installed the present regime in Ukraine, during a violent February 2014 coup, wants Poroshenko to continue bombing that area. France’s Francois Hollande, and Germany’s Angela Merkel, are again trying to stop Obama’s war in Ukraine. But Poroshenko is taking his instructions from Obama, not from anyone in the EU. And probably the EU will, too, as usual. Today’s nazi rioting has been organized to give more ‘democratic’ legitimacy to resuming the war.